Since I was a little girl, I have been ambitious. I set my eyes on a goal and I do what it takes to make it happen. This ambition, thankfully, has stayed with me through adulthood. Unfortunately, I sometimes get so fixated on making it happen just right that I lose sight of the progress that I have made along the way. 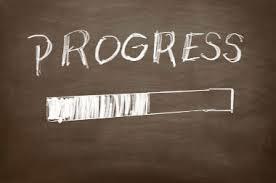 On the way to larger goals and milestones, I have to remind myself that progress is growth. It has helped me to not be so hard on myself. It has also helped me to re-evaluate where I actually want to go. As I continue in my thirties, I want to keep that in mind, especially as I welcome a new child into my life! 30 by 31 Lesson #8: It’s about progress, not perfection. Make sure to acknowledge all of your growth as you get to your next step.